Viewing time: 4 min. 40 sec. The Write Question is a weekly video podcast all about writing. Today’s question focuses on capturing family history. If you have a question you’d like me to answer, email me at daphne@www.publicationcoach.com, tweet me @pubcoach, or leave a message for me at the Skype account, The Write Question. Welcome to The Write Question, I’m Daphne Gray-Grant. 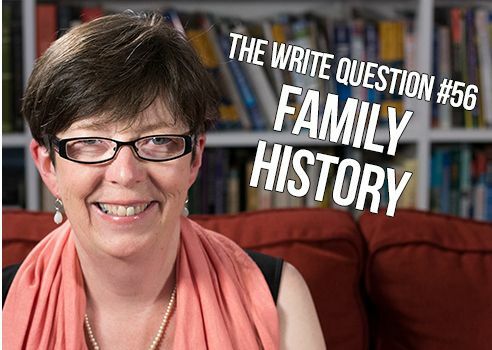 Today I’m giving advice on how to write a family history. Thanks for the question, Beth. You have some very lucky grandchildren! My own mother wrote a four-page history of her life growing up and I treasure that document, only wishing she’d written more. Let me give you some advice about how to approach the interesting task of setting down some family history. Keep the genealogy separate. It’s valuable work and it’s interesting to genealogists but it’s not so fascinating to anyone else. I can tell you that my husband likes genealogy quite a bit but he has not been able to engage me. Despite trying all sort of tricks to catch my interest, like finding previously unseen photos of my great grandparents, he hasn’t been able to raise my interest in geneology. What your family is going to be interested in is the STORIES. Human beings are hard-wired to respond to stories and that’s the unique gift you have to offer your grandchildren: your own experiences and the memories your parents or grandparents shared with you. For example, I remember my mother telling me an unforgettable story about her mother, whom I never met because she died before I was born. My grandmother was a talented musician who played both piano and violin and — amazingly for a woman in those days — became a conductor in the early 1900s. She had been born in Joggins, Nova Scotia and went to university at Mount St Alison in Sackville, New Brunswick. While she was attending university, her own mother, my great-grandmother, was dying of cancer. So, my grandmother rode a horse and carriage home every weekend. Her carriage was on a sled in the winter. In 2005, in the months following my own mother’s death, my family and I made that trip, from Joggins to Sackville by modern car and it took us 40 minutes. We were astonished that my grandmother had been able to do it every weekend on a sled. It gave us something to think about and really made me feel well connected to my own family history. That’s the kind of story your children and your grandchildren will find interesting. I’ve included several links below to blog posts I’ve written on the value of stories. Check them out and mine your own life for stories that your family will find interesting. Story telling is the oldest of all the arts. Before the printed word, people had to remember stories. Good stories don’t just recount facts. They capture emotions and feelings. That’s what makes them interesting. When you do your first mindmap here’s the question I suggest you write in the middle of the page: “What are the stories I most want my grandchildren to know?” As you explore this question, all sorts of incidents, memories and ideas should surface. And, as you work to round up this material for your grandchildren, Beth, don’t let the facts get in the way of the stories. Story telling is how we make sense of human existence. It forces us to identify a beginning, a middle and an end and it helps link us with the generations that went before us. Thanks for your question, Beth. If you can focus on stories you’ll not only write something your grandchildren will really enjoy, you’ll also have a lot of fun doing it.